On Tuesday, Regional Council will be asked to consider the Long Term Arena Strategy report which proposes to close all rinks in Bedford, Dartmouth and Halifax and replace them with two new four pad facilities. The report says it will save HRM $2 million a year to operate the two new complexes. I think the question should be – should HRM spend $90-100 million to build new facilities instead of repairing the existing ones for $18.8 million? When you look closely at the numbers, HRM will save little to no money at all. HRM needs to spend smarter, and the report doesn’t make the case that this investment is the best, most cost efficient way to address HRMs recreation and amateur sport objectives. The two new four pads will cost $90-100 million. HRM’s share, assuming federal and provincial support, would be between $30 and $33 million. Divide HRMs cost of the new facilities by 25, the life of the new buildings. The cost per year is at least $1.2 million a year! Suddenly the the $2 million yearly savings just dropped around $800,000. Additionally, Sportsplex isn’t being closed, what remains (the pool, the community rooms) will still need a roof and other significant renovations. The cost of this maintence is not included in the report. The Forum would be substantially reconfigured, or even leveled and replaced with three or four new surfaces. Right now the Forum uses all its other operations (trade shows, music concerts, Christmas at the Forum) to generate revenue that essentially covers the cost of operating the ice surfaces. The Forum’s ice costs the city nothing right now. Lost revenue is not considered in the report. HRM would need to build a facility to replace the Forum Multi-Purpose Room (home of concerts and the flea market on Sunday) and of course the venerable Forum would be gone, removing a 5500 seat arena, HRMs second largest indoor venue. This cost isn’t included in the report. Distressingly, the report wrongly says the 1920s vintage Forum is at high risk to fail, and paints a picture of a 90 year old facility barely holding on. Actually, the Forum rink had an all new concrete slab and in-floor refrigeration pipes and a de-humidifier installed in 1999. The other ice surface, the Civic, was built in 1995. Later in the same report the Forum is identified as being in great structural shape. The report includes the cost estimates to renovate existing six rinks at $18.8 million. This is the cost for renewal, which would fix roofs, exteriors, provide mechanical upgrades, which would improve heating, cooling and insulation. Operational savings created by renovations are not included in the report. So our savings are starting to drop down pretty much none, or even a net loss, depending on all these other associated costs and savings. Suddenly, we are spending $90-100 million on new buildings to save nothing. A problem with this report is that it looks at the arenas in isolation, as recreational ice surfaces, without looking at them in an overall context of recreation and city services. Some ice surfaces are in rooms that can host Moosehead’s games, or John Mellencamp concerts. The proposed complexes will not have this capacity. Council has to consider dozens of other community uses that the current facilities provide. The report doesn’t look at what current facilities offer, and the synergies that exist providing ice surfaces in multi-use facilities like the Sportsplex and the Forum. The report does not ask the questions – do we believe in centralization? What happened to working to create walkable communities? How will Eastern Passage and Bedford feel about having to drive to Shannon Park instead of Bowles in Woodside or LeBrun in Bedford? Not everyone using these rinks is driving, are we really walking away from providing these services to socio-economically challenged communities where potential users are unlikely to own a car? Or people who chose to not own one? This impact needs to be carefully considered. The report compares the cost of operating a 40 year old, un-renovated single ice surface with cost of operating a brand new four pad, but it doesn’t show what a renovated 1 pad costs, or a new 2 pad, or a new 3 pad. It does not talk about how the four pad charges $5-6.00 for an adult free skate, and HRM’s rinks only charge $3.00. We need to examine all the implications. 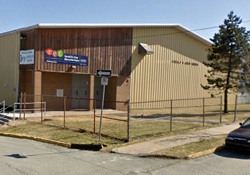 There are pressing issues with the truly dilapidated condition of Devonshire rink, and Dal and SMU are looking for a partner to help replace their own ice needs, though this is far from a done deal. HRM needs to spend smarter, and in this case, renovation balanced with some new construction seems the far more cost effective option.